The Razor E300S is an electric scooter built by one of the biggest vendors in the world of scooters. In fact, it was Razor who managed to bring back the trend of riding micro scooters everywhere a little over a decade ago. The Razor E300S is one of the best electric scooters I have seen in a while. Let’s start off with the facts. The Razor E300 highly recommended to someone who values premium quality at an affordable price. The removable seat and large foot room offer great comfort while riding in any position. The only thing to really bear in mind is that recharging takes quite a while so it is not exacctly perfect for commuting especially when you travel long distances. What is the Razor E300S? I am going to talk a little bit more about this electric scooter later on. Right now, I really want to point out that this is a seated electric scooter. The seat is fully removable if you wish, although it has been built with the seat in mind. If you want a scooter which has been built for standing up on, then you may want to look at some of the other options on the market. That being said, it is ideal for those who need a lot of foot space when they stand up, because this scooter has been built with a larger-than-normal deck to accommodate the seat. This scooter is able to hit a whopping 15 miles per hour, which is going to be about the same speed that you would be travelling on a bike, but you are going to need to be putting in a whole lot less effort on a Razor E300S. It is going to be a lot easier to store when you need to too (more on that in a short while). The range is a little bit lower than some other electric scooters on the market. The maximum you will feasibly be able to hit with the Razor E300S is going to be 10 miles, so this is around 40 minutes of usage. This is all going to be dependent on your riding style, though. The more pressure you put the scooter under, the lower the distance it is going to be able to travel. Not really the fault of the scooter that, though. 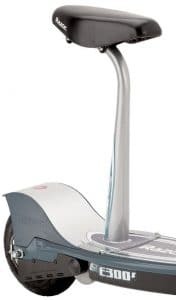 There is one issue that I have with the Razor E300S and that is also one of the reasons why I am so reluctant to recommend it as a commuter scooter. It has a whopping charge time of 12 hours, which means that if your commute is more than twenty minutes in either direction, you are going to be cutting it pretty fine as to whether the battery will last you or not. You certainly would not be able to charge it to the max while you are at work and, as you know, the last thing you want to really be doing is charging your battery up only a little bit of the way. This is actually a great shame, and it is one of only a few things standing in the way of this being a good ‘all purpose’ electric scooter. Before I wrote this review, I read through a ton of other reviews for the Razor E300S online. Most of them seemed to imply that the scooter was built for kids. I don’t think it is. Sure, kids can use it, but this is an adult scooter through and through. It is able to support weights of well over 200lbs, and I don’t think there are many children out there who are bordering anywhere close to this amount of weight. Incidentally, this is one of only a few electric scooters on the market which is able to support a huge amount of weight like this. Most others won’t come close, although do bear in mind that the heavier you are, the lower the range on the scooter is going to be. The seat that comes attached to the scooter is fully padded, and it is a true joy to be seated on. While I anticipate that the majority of people who pick up this scooter will inevitably end up removing the seat, it is nice to have in place anyway. It is sometimes good to relax after a long day at work or at college. 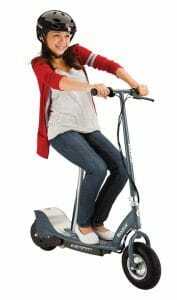 What I do love about this scooter is that you have a lot of foot room that you can play about with. I reckon that the Razor E300S is going to be getting a lot of praise from people who have larger feet than normal. I am in that boat. My feet barely fit on some of the other scooters out there, and it is just an uncomfortable ride. I have to constantly move them about to try and do anything which is incredibly annoying. This is well and truly an electric scooter which has been built for comfort, and that is all that you really want from one, right? Oh, no? Well, OK. There is more than you will need to know. Have you ever had such an amazing dream that you can’t wait to fall asleep again so that you can experience it some more? Well, that is what riding this scooter is like. It is amazing. Probably one of the best scooters I have ever had the pleasure of hopping on and riding. That is not even an exaggeration. It is simply that good. The thing I love about this scooter is that the handlebars are just so responsive. Since you are going to be zipping along at a quite high speed, you need them to be responsive. You want the wheels to start moving instantly, taking you in a new direction. It is hard to explain, but some of the cheaper scooters on the market are not like this. They take a split second to react, or there is some sort of stiffness in the handlebars which can really hamper your travel. That is not an issue here. That being said, the handlebars are not so responsive that you are going to be able to do tricks with the scooter. It is probably a bit too bulky for you to do anything of the sort. It is more a travel scooter than anything else. I do want to point out that you are not going to be going off-road on this electric scooter, although there are few on the market, decent ones at least, where you can do that. This is just for paved surfaces. Yeah, it does have air-filled tires so you will be able to go over things which are a little bit bumpier than the norm, but it still won’t be smooth off road, and I seriously doubt the battery would last for a long amount of time if you are on bumpy surfaces anyway. To cap it all off; the braking system is fantastic. It is all done through the handlebars and, just like the steering, it is going to be incredibly responsive when you are riding it. It is truly a wonderful scooter. 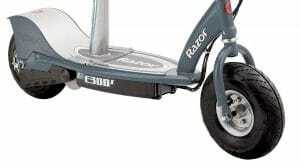 This is a Razor scooter, which means that you can easily expect it to be one of the best in the business. This is a company that has been kicking around for an incredibly long time now, and part of the reason for that is because people know that when they pick up a Razor electric scooter, they are going to be getting something that will blow all the others out of the water. Many people turn their nose up at this scooter because it is incredibly cheap in comparison to some of the other electric scooters out there. I agree with that. In most cases, if something is a bit too cheap, then it is really a case of ‘too good to be true’, but with a Razor scooter, you do not need to worry about that. At the risk of giving you an epic economics lesson here; Razor is a company that relies on economies of scale. They produce a lot of scooters. In fact, I think they are one of the biggest scooter producing companies in the world. This means that they are able to buy the parts that they need in bulk, and produce their scooters in bulk. All of this helps to bring the cost down. Of course, you also have the benefit of them knowing what they are doing. I don’t know if you are aware of this, but many of the electric scooters on the market are not actually produced by the companies who are selling them. Instead, they outsource the production and just slap their name on it in a bid to make some cash. That ain’t going to be an issue with the Razor scooter range, no matter which one you end up buying. This is a company that controls every single stage of the manufacturing process, and this means that they can assure that the products they deliver you are going to be of the highest quality possible. I don’t think I have ever heard of an electric scooter from Razor just randomly failing. If one of these babies breaks on you, then chances are that it is something that you were doing wrong as opposed to there being an actual issue with the scooter that you have purchased. This is a product that is built to last, and should parts start to wear down (this is going to be inevitable), then you can be sure that Razor will be happy to supply you with the parts that you need. However, their scooters are popular enough that you should be able to source the parts from several different places with ease. It is probably worth pointing out that the Razor E300S only has a 90-day warranty if you are buying from within the United States. This is not necessarily a bad thing. As I mentioned previously; Razor have some of the best build quality on the planet, so it is seriously unlikely that your scooter is going to be dying on you any time soon. If it does give up the ghost, then it is going to be years and years down the line. Warranties would not cover you then anyway. That being said, the customer support that Razor offers is second-to-none. If you run into an issue with your scooter and it is their fault, even outside of the 90-day warranty period, then they are going to be more than happy to help you out. Just pick up the phone and give them a call. The chances are pretty high that they are going to be able to fix whatever issue it is you are having with your scooter. 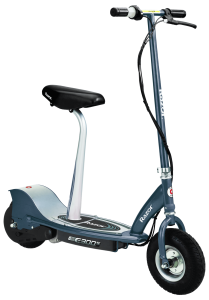 Who is the Razor E300S seated electric scooter for? Well, if you are only commuting ten to fifteen minutes into work, then I reckon that this scooter is going to be fine for you. It is let down a little bit by the charge times, but if you are not travelling that far on it, I don’t really see that the charge time is going to pose that much of a problem. Honestly, for me, this is a scooter really designed for those children who are going to be zipping from point A to point B for a bit of a fun. Actually, thinking about it, it is very much a scooter for college students who want to get around campus quite quickly. If you fall into either of those camps, then I have absolutely no doubt that you will be happy with this electric scooter! Other than the higher than average charge time on this electric scooter, I reckon it is going to be worth the money that you end up spending on it. 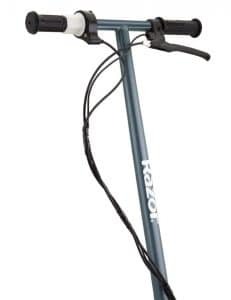 It is a nifty little scooter, and as with all of the products that you can get from Razor, this is sure to put a smile on the faces of anybody that ends up using it. It comes in at an incredibly affordable price too, which most similar electric scooters on the market do not!